Today, my camera and I came face-to-face with a family who had just learned someone they loved died in a house fire. It had been a while since I had been there — quite a few years in fact. I took photos. No problem. I interviewed them. No problem. Before I could get that last word out and escape unscathed as I had done for the past 20 years, something happened. Something horrible and unforgiving. Something humiliating, embarrassing, and totally unprofessional. I’m not sure what the couple I had been interviewing thought. I think they must have been a little surprised. But I know how I felt. So the question remained, why? Where the hell what that coming from? Am I becoming weak and overly sensitive in my middle age? Or has the events of recent weeks caught up with me emotionally? I’m not completely sure what it was, but I believe I broke one of my own rules: I didn’t just look at her eyes, I looked into them. I’m not saying that for the past 20 years I’ve been stone cold while covering tragedies in the course of my job. It’s just that in the past, I was able to delay reaction until I was safely out of sight of any human being. When Trinkus Manor burned to the ground, I remember standing off somewhere by myself crying. I cried at home after covering a fire and funeral in which 6 young children died and were laid to rest in 6 little white coffins. 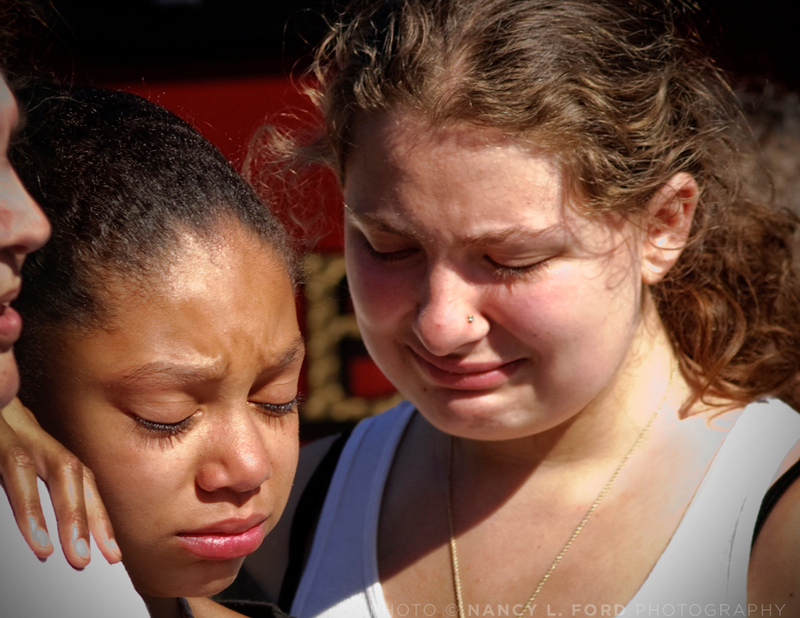 I cried at work while working on a photo of an EMT who was crying because he was not able to revive a 7-year-old girl. I cried on the way home from an interview with a concentration camp survivor. 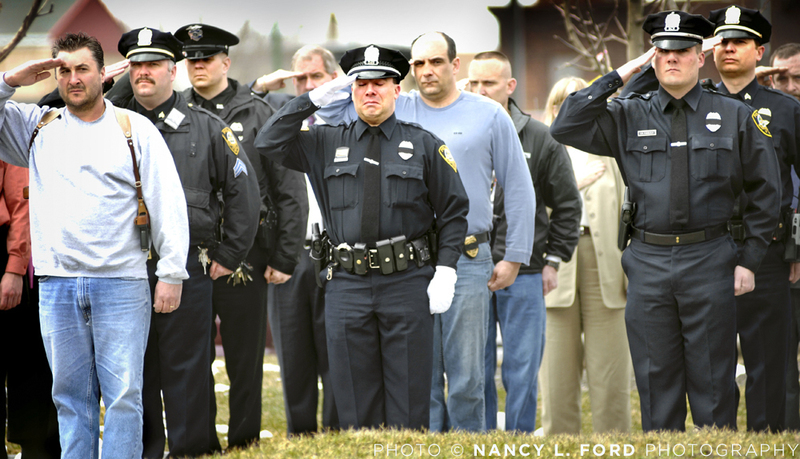 There has even been many times when I struggled to contain my tears when the only thing between me and “them” was a camera; like when the body Utica Police Officer Thomas Lindsey, killed in the line of duty, was driven by his grieving fellow police officers at UPD for his final “All Clear” to mark the end of his tour of duty. But I have never, ever, cried in the face of anyone, especially someone I was interviewing. Maybe I was just so out of practice that I forgot to turn “it” off. I may never know. What I do know that if it happens again, it may be time to hang up my journalism camera. After all, what would the world be like if all the media really did show how much they really care about the people they were covering? What if the paparazzi became extinct and all photographers respected the people they photographed? What if photographers and reporters cared so much they cried while they were covering tragic news? I can just see the trail of discarded tissues littering the ground after the dust settled at every crime scene. “Yep, the media was here,” people would say. I wasn’t sure what to do as I stood there, my hand on the woman’s arm with my eyes welling up with tears. So I did what any self-respecting journalist would do to clean up such a mess: I gave her arm a squeeze and I let my eyes quickly turn away and hit the ground. But it was too late. She reached out and pulled me in for a hug. Damn! I almost got away. She may never look at journalists the same again. This entry was posted in Photography, Photojournalism. Very nice essay and very wonderful web site and photographs. I was born in Utica and grew up in upstate NY. Although I left over 50 years ago, your photos make me very homesick.. Thank you.